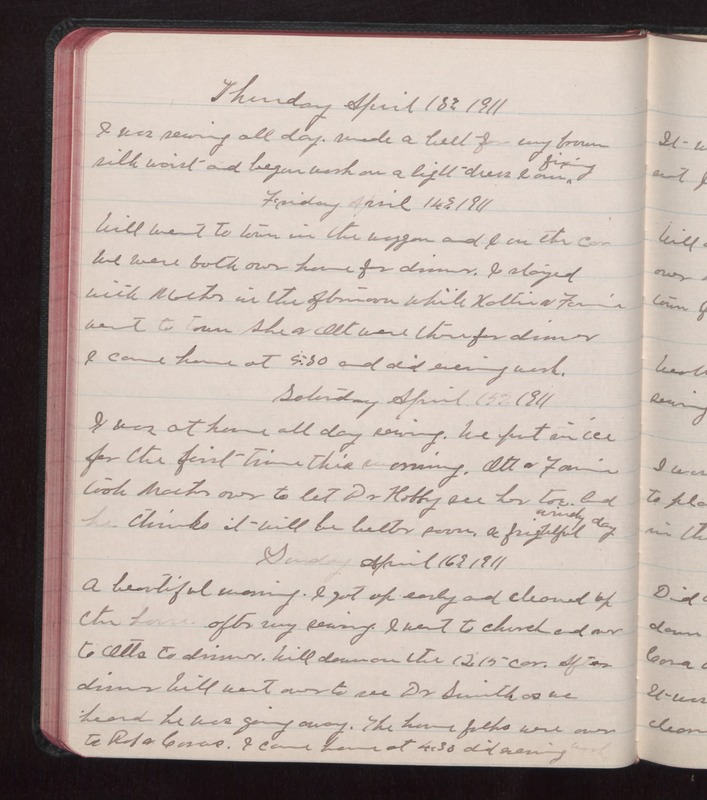 Thursday April 13 1911 I was sewing all day. made a belt for my brown silk waist and begun work on a light dress I am fixing. Friday April 14 1911 Will went to town in the waggon and I in the car We were both over home for dinner. I stayed with Mother in the afternoon while Hattie & Fannie went to town. She & Ott were there for dinner I came home at 5.30 and did evening work. Saturday April 15 1911 I was at home all day sewing. We put in ice for the first time this morning. Ott & Fannie took mother over to let Dr Hobby see her tow. And he thinks it will be better soon. A frightful windy day Sunday April 16 1911 A beautiful morning. I got up early and cleaned up the house after my sewing. I went to church and over to Otts to dinner. Will down on the 12.15 car. After dinner Will went over to see Dr Smith as we heard he was going away. The home folks were over to Rob & Coras. I cam home at 4.30 did evening work.